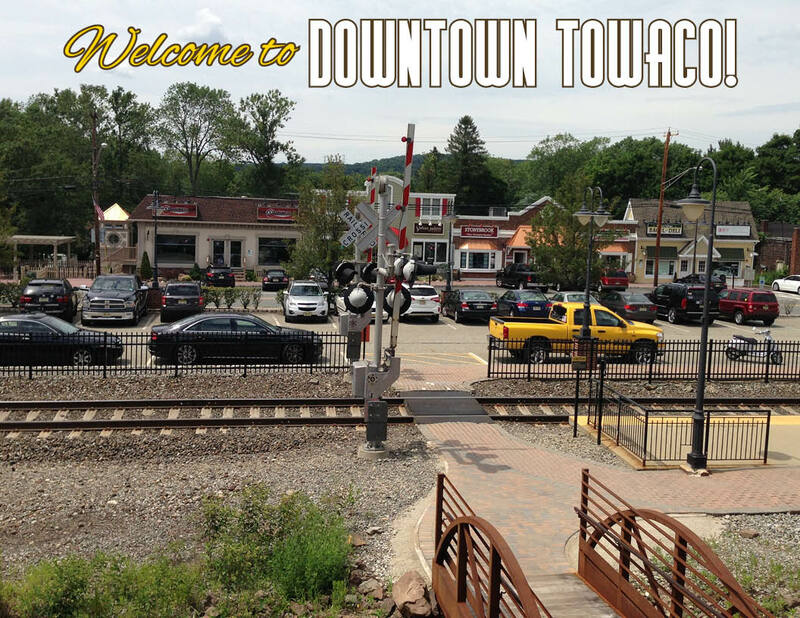 Towaco is Montville's New Downtown! Towaco is Montville’s New Downtown! One of the best things about Morris County is how many traditional downtowns full of small, local businesses we have. Outsiders might be surprised that we can be so old-fashioned in a state that’s criss-crossed with major highways and big box bargain stores, but those in the know realize NJ offers the unique opportunity to enjoy Norman Rockwell style charm with Mid-Town access and world class culture and dining all around you. Two years ago, Money Magazine named Montville the #13 Best Town to Live In in America. Despite high praise, the one feature they felt Montville lacked was a real downtown for its residents. Change was already in the works, though, and I’m happy to report that thanks to the efforts of investors, residents and the local government, Towaco center is transforming into the kind of walk-able downtown that anchors a community. The area around Montville’s train station is suddenly home to a thriving group of new businesses with many more to come. Right across from the station you can get coffee, crepes, bagels, wood-fired pizza, a hair cut or color and expertly arranged flowers. On Sundays, the Farmer’s Market comes to the Towaco Train Station lot. This amazing array of fresh, locally grown goods is named the The John Becker Farm to Table Farmers Market in honor of long-time Montville resident John Becker, a well known volunteer and advocate for getting Montville its own farm market. Locals are loving the opportunity to get the best seasonally grown goods, surrounded by their neighbors, in this happening new hub of activity. The biggest addition to the downtown is Towaco Crossing. This mixed use development anchors the space right next to the train station with a variety of businesses, high-end apartments and, last but far from least, Rails Steakhouse and the Thirty3 Speakeasy. I’ve been visiting the steakhouse regularly since it opened and I was dying to find out more about what’s in store for us as shops fill in and Rails takes its place as a local fixture. The Rails team is very proud of what they’ve built so when I started asking questions, they invited me over for lunch on the terrace and a full tour of the whole facility. First, I have to say that I’ve rarely seen a better spot for al fresco dining. Lunch on the terrace was perfectly relaxing, with a waterfall flowing down the wall beneath me and the occasional train rolling through the station. One of the best things about Rails is the number of ways you can enjoy it. There are three separate floors of beautifully designed spaces, including two terraces with bars, upstairs and downstairs dining & bar areas, two private rooms for special events, and the speakeasy style basement level Thirty3. 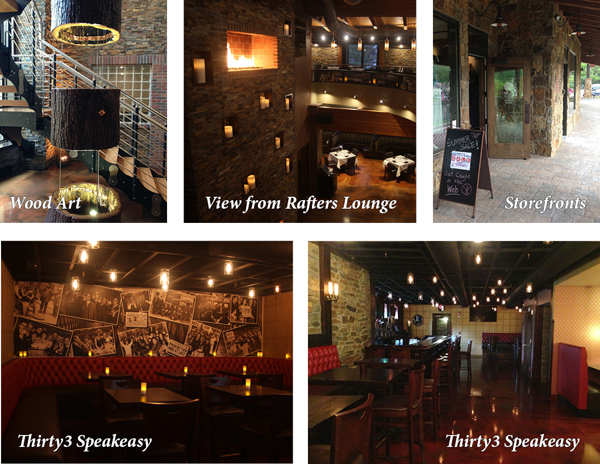 Guests are known to stay for hours, enjoying drinks before dinner, a luxurious meal and then heading down to the speakeasy or upstairs to the Rafters lounge for live music every weekend! The menu had something for everyone. Meat lovers will adore the thick cut, maple glazed bacon appetizer and the mouth-watering selection of steaks and burgers. Anyone looking for a lighter meal will enjoy the seafood and salad offerings. On the day I was there, the salad special was a lightly grilled slice of watermelon with goat cheese, strawberries and arugula. It tasted like summer on a plate! The Cobb salad also stood out as a genuinely satisfying entree salad. Executive Director Michael Mulligan sat down to tell me all about special dining & drink events coming up. Starting July 14th and going on through August, customers can look forward to a Barbecue Throwdown every Tuesday when expert judges will compare customer-made sauces to the in-house offerings. If you think your sauce has the right stuff, this is your chance to let the world know! Even if you’re not in a competitive mood, there will be Southern style specials to look forward to. Executive Chef Frank Falivene is working up memorable feasts including brisket sliders, smoked whole pig, BBQ shrimp & cheese grits, & beef ribs. 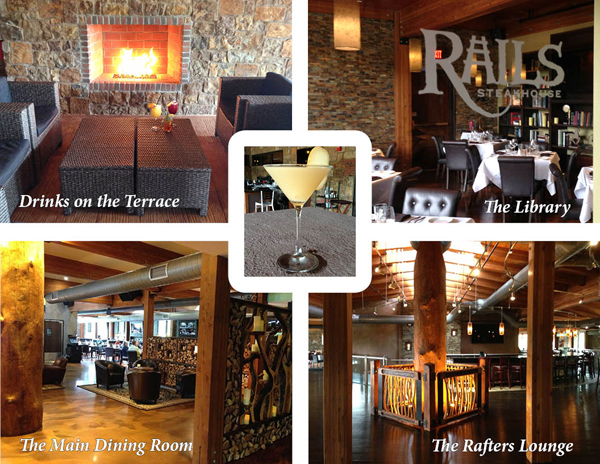 Rails’ stellar wine & cocktail selections are also coming to the forefront this Summer. All Summer long, guests can look forward to cocktail specials featuring freshly pureed seasonal fruits and herbs grown right in the restaurant’s rooftop h erb garden. I tried a few, and although the white and red sangrias were delicious, I couldn’t get enough of the spiked Arnold Palmer with iced tea vodka, lemonade, peach puree and mint leaves. And later this Summer, bartenders will be competing to be named Rails’ Iron Bartender. They’ll be challenged to create with pre-chosen theme ingredients and only one can be the Iron Bartender. Wine lovers should look into the July 7th Joseph Phelps Wine Tasting Dinner. 6 courses will be expertly paired with wines from this highly regarded Napa vineyard and Elizabeth Phelps will be in attendance to offer her insights. Call now to RSVP before it sells out the intimately sized private Mosaic Room! As for retail, Towaco Crossing is bringing in a variety of offerings. Charlotte’s Web is already up and running and offers a huge selection of jewelry, accessories, gifts and clothes. It’s fun and very stylish and I couldn’t leave without buying a few new things. Also coming soon is a TRX Training Facility for getting fit and a health-conscious cafe and smoothie bar for your post-workout cool down. A dry cleaner and a salon are also in talks with the owners and may soon round out the storefronts. As a Realtor, I can tell you that all of this development will be excellent for property values in town. Prospective homeowners absolutely love a downtown with a train station and some real personality. Take a look at the NJ Transit map sometime and you’ll see that some of our County’s best property values follow the train tracks to NYC. Buyers want more than a bedroom community after that ride home. Imagine getting off the train at Towaco station, stopping for a refreshing drink outside at Rails and then heading home with some flowers for the table from Blush & a wood fired pizza from 900 Degrees. There’s nothing quite like connecting with your town and its unique businesses to make you feel fully at home. Jacqueline Scura is a Top Selling Agent in NJ and has over 29 years of experience as a Realtor. Her unparalleled local Real Estate expertise and involvement makes her a resource for Morris County Real Estate Advice & New, Town Events and Information and Household Tips & Tricks. She specializes in Parsippany Real Estate, Boonton Real Estate, Boonton Township Real Estate, Denville Real Estate, Montville Real Estate, Rockaway Township Real Estate, Caldwell Real Estate and Mountain Lakes Real Estate. Narrow down your search for Rentals or Condos and Townhomes on my site!